Homepage. 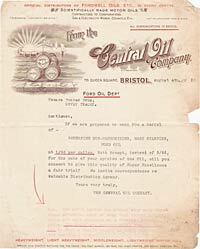 This page: Two illustrated letters sent by Central Oil Co. to a garage in Bovey Tracey. Old letters sent by an Central Oil Company Ltd. Both of these letters were written by the Central Oil Co., and sent to Tucker Bros. who presumably operated a garage, in 1922 - one is dated August 3rd, and the other August 4th. Each has a fine illustration at the top of the letter, hence their being shown here! Yours Faithfully, Central Oil Company." 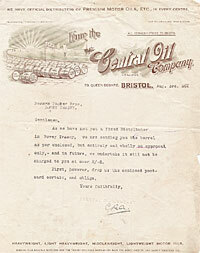 The heading of the letter advises that Central can supply 'Premium Motor Oils', and they were contactable via telegram at "VISCOSITY, BRISTOL". The illustration shows various barrels of oil at a quayside, each marked up with different customers and types of lubricant - those I can make out include GAS ENGINE, STEAM ENGINE & SHAFTING, WOOL, SPINDLE, CRANK, MARINE, OIL ENGINE, FORD MOTOR, FILTERED CYLINDER, SEPARATOR, CASTOR, TURBINE, SOLID, SENTINEL, FODEN, CHARABANC, MOTOR HEAVY OIL, and MEDIUM MOTOR OIL. Both illustrations incorporate the name H.T. Painter, perhaps it was he/she that did created the artwork?? "Gentlemen, If we are prepared to send you a barrel of - SUPERFINE NON-CARBONIZING, EASY STARTING, FORD OIL at 1/9d per gallon, Nett prompt, instead of 3/6d, for the sake of your opinion of the oil, will you consent to give this quality of Super Excellence a fair trial? We invite correspondence re valuable Distributing Agency. Yours very truly, The Central Oil Company." "P.S. The above letter has opened very many first class accounts, most of whom send repeat orders which are only executed at a somewhat higher price. The privilege however still remains for you to test a sample barrel at 1/9d, but only for immediate reply." The heading on this letter reads "Official Distributors of Fordwell Oils etc in every centre (Scientifically made motor oils)".